Server will be closed for about an hour at about 22:30 server time. Added in-game changelog that appears after login if there are changes on server - now with it you will be informed about all next small changes = more small updates instead of waiting for major updates . Due to changes introduced in this update you need to update booster if you're using it. Fixed Deluxo scores in garage/races/performance shop. Improved custom races system by allowing players to choose vehicle before joining lobby. Custom races now update automatically while you're in menu, no need to refresh them all the time. Time trials now show time left until next availible race in main race mode selection menu. Added ability to spectate races, race creator can specify if his race can be spectated, and set custom password for spectators. The controls as spectator are as follows: left/right arrow to change between spectated players, 'O' to open side menu that displays statistics and ability to leave race. All race types except of drag have been fully prepared for spectating. Drag is working, but isn't perfectly synced for now. 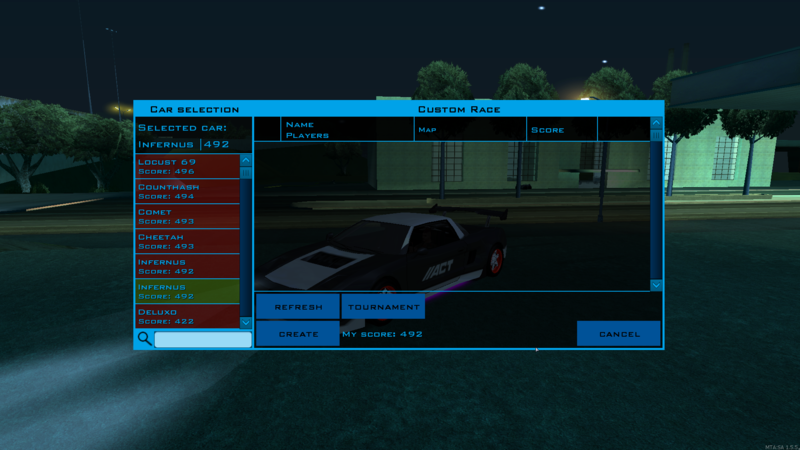 Removed old quick races system, replaced it with new one, that allows you to select multiple vehicles and search for race with all of them. As this system is completely new, expect some minor problems with it, all feedback is welcome. Added ability to join races from freeroam, by default you need to use 'shift + k' to open the menu. To be able to open the menu you need to be standing still, and not be in any marker. You can stop Magazine / Diamond Hunt event using F6 (or the key you have assigned for leaving stuff). Added completely new, mouseless camera modes inspired by NFS games. Camera has 5 modes: near/far follow, drift camera, hood camera, and bumper camera. All of camera settings are configurable in server settings. Old camera modes are still availible and useable, you can change camera modes using default camera change key. New camera modes have custom "jump camera" mode that is used while in big jumps, you can disable it in camera settings. Camera has 2 presets, normal and drift one, it will automatically change to last one used in given mode. Each rim can be now selected individually, meaning you can use 4 different rims at the same time. All rims share the same size due to technical limitations. 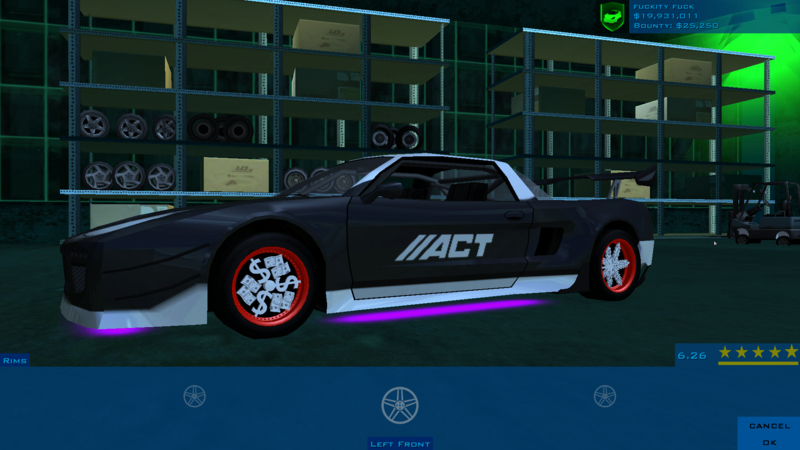 You can mix normal rims with spinners, you can't mix any of them with offroad wheels due to technical limitations. 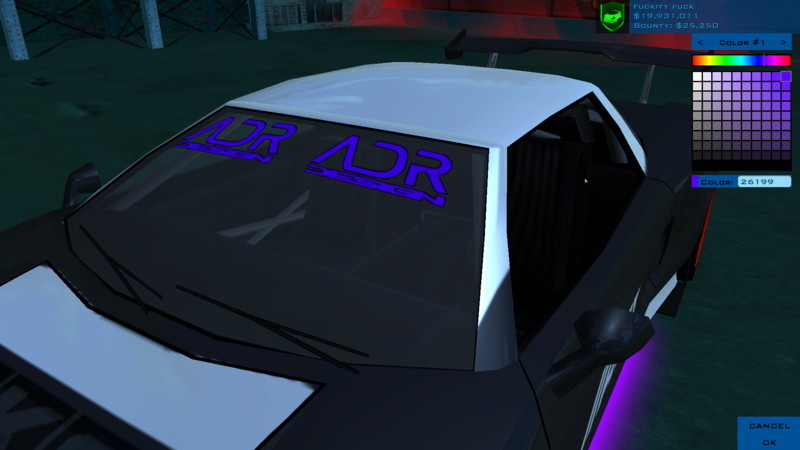 Added ability to color car decals in Paint Shop. You can now choose exhaust color in Accessories Shop. Vinyls selection now show preview image in the bar at the bottom of the screen. (Disabled for body/camo/special vinyls). At layers view in paint shop your vinyls are displayed along with used colors in the bottom bar. Added one additional vinyl layers pack exchangeable for task point. Added 2 more vinyl layers availible in paintshop by default. Added 1 more vinyl layer for donators. Added text input for color selection, by default it uses server custom hsv format, but you can enter HEX color codes into it, like "#FF00FF". Added text input for vinyl position, the bottom and top limits are still the same, but you can position vinyls a bit more precisely using decimal numbers. Added ability to sell vinylpoints, 3 for $1000. Old rims system was replaced with new one to accomodate the ability to use different rims on each wheel. It should be more optimized, but as with all new things it may have it's problems, if you notice anything out of place with it, report that on forum. Removed some issues that were causing URLs to be stuck in limbo, hopefully those were all the issues, and URLs aren't gonna do that anymore. Fixed issue with crew permission that blocked people with proper permissions from changing other people ranks. Fixed exploit that allowed people to start police pursuits in wrong dimension, resulting in cops in freeroam, races and URLs. Fixed some issues with race/duel/magazine timers that allowed people to abuse them. 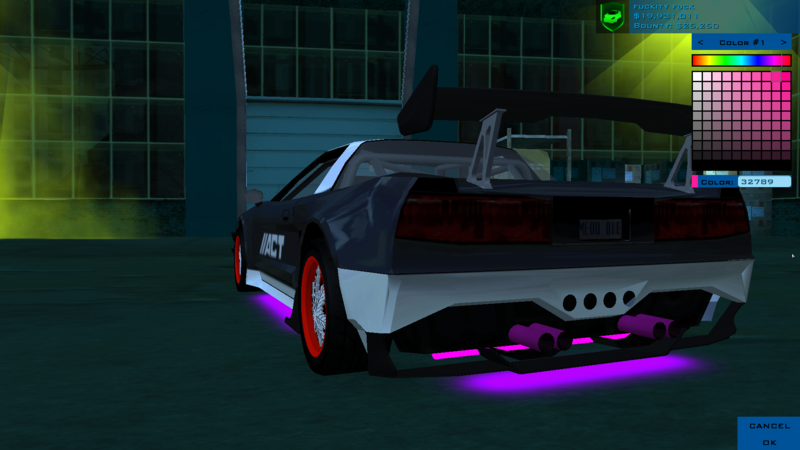 Fixed neons not displaying under car in garages. Cars in paint shop were given proper paintjobs instead of having all tuning applied to them at once. If ya had static cars enabled, you could observe beautiful big phoenix car stuck halfway in the ground in some garages, fixed it. Fixed some issues that allowed you to bug garage entering. Fixed some issues that allowed you to get your camera stuck in place when entering garage. Removed ability to reset car position in most menus while in freeroam, as it somehow allowed bugging too. Fixed car visual score being 0.0 when entering some garages. Optimized many parts of the gamemode, race UI should be having less effect on game performance. Rewritten entire vinyls loading system to remove unnecessary actions and reduce memory usage in places that allowed us to. Fixed some issues caused by leaving drift/speedtrap races while final countdown was enabled. Fixed some issues with map selector not stoping rendering quickly enough when going back in menus. Fixed car windows being visible from one side only. Fixed some lags when entering car selection in garage, that were caused by tuning manager trying to apply tuning multiple times. We already started working on adding new maps and vinyls, but because we wanted to release this update as soon as possible we didin't manage to finish this work in time. You can expect new maps and vinyls in the next few days - you will be informed about them by new in-game changelog. 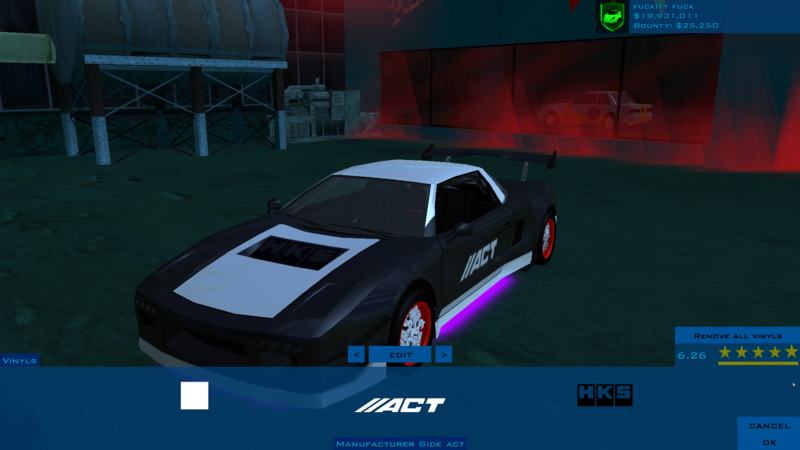 [*]Added ability to color car decals in Paint Shop. [*]You can now choose exhaust color in Accessories Shop. [*]Added one additional vinyl layers pack exchangeable for task point. [*]Added 2 more vinyl layers availible in paintshop by default. [*]Added 1 more vinyl layer for donators. [*]Added ability to sell vinylpoints, 3 for $1000. you da men Bartek and the rest of dev team!